To get the absolute most out of call recording, you need to know what to look for. 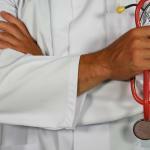 You need to be able to identify when things go wrong, or when they go right. You need to be able to recognize why the call went the way it did. When you’re able to do this, you can begin optimization, knowing you are optimizing based on correct assumptions. Now… you’ll never be right 100% of the time. However, as long as you’re careful to TEST every improvement or change you make, and make sure it’s bringing in additional revenue, you will improve your systems very quickly. In this section, I’d like to briefly go over some initially vague concepts, that I think will be helpful for you when you use them with call recording. In sales and customer support, it’s not always WHAT the customer is saying. More often than not, it’s HOW they’re saying it. It can be easy to look at a sales call as the words both parties say. And, many organizations do just that. This is the main reason why sales scripts are so common place. The idea is, if you get the words right, the sales will come. That’s true, to some extent. Sales scripts are an absolutely vital part of any sales process. However, a sale isn’t based on words alone. It’s based on many different factors. It’s based on the mindset the prospect comes to you with. It’s based on information they have regarding your product that you don’t know they have. It’s based on the trust and rapport between the salesperson and the prospect. It’s based on how the salesperson FEELS when they’re in the call, and even the type of day they’re having. In any first-time conversation, there will be slight awkwardness and uncertainty. At this early point, neither party knows much about the other person. At this stage the salesperson will be trying to decide who exactly they’re talking to (more on this later). And the prospect has their own agenda. Whether they’re looking to buy, or they’re looking to just get some more information. How much they’re willing to spend and if they plan to negotiate at all. So, in the early stage of the call, it’s the sales or customer support rep’s job to identify the needs and goals of the prospect. At this opening stage, the sales or support person can build trust and rapport, by asking pointed, intelligent questions, and keeping the conversation going in an upbeat manner. As the conversation continues, a moment will “break the ice”. At this point, the real conversation begins. At this point, both parties become comfortable, and allow themselves to say what comes to mind quickly. If the sales or customer service rep has handled the call well, the prospect or customer will be in a light state of mind, and will be expressing more about their needs, and what they’re looking to get out of the call. The point of any sales call is to make the sale. The point of any customer service call is to quickly and efficiently solve the issue the customer has. In the course of either of these calls, information will be discussed which will lead to a “rise” in the call, or a “drop”. In a sales call, the customer may be ready to buy and be expecting a certain price. The sales rep then informs the customer that the price is actually discounted for the day, so the customer will pay less than they expect. At this point, the conversation “rises”, as the customer gets excited, and in a positive state of mind. In a similar sales call, the customer is unsure if they want to buy or not, and they are not aware of the price of the service they’re interested in. The call is going well enough. However, the prospect asks what the price is, and the salesperson simply comes out and names the price. Whether or not this is the price the prospect wanted to pay, the way the salesperson approached it caused the prospect to feel fear. Instead of thinking about what the service will do for them, they’re now thinking about what the service will cost them. Fear causes them to “close up”, raises their voice tonality and rate of speech, and contributes to a “down” in the conversation. Both rises and drops contribute to the overall flow of the conversation, and ultimately determine the end result of the call. It’s important to note that a rise is not necessarily always positive, and a drop is not necessarily always negative. In any conversation, both rises and drops will undoubtedly occur. It’s the job of the sales or customer service rep to keep their calm and know the exact strategies to handle each situation and keep the conversation moving toward the goal. This is where call recording really shines. Even the best sales and customer service reps can experience “tunnel vision”. They’re so focused on the call, that they lose track of the overall flow of the conversation. Once the call is done, using call recording to listen to the call will make it very apparent when the conversation rises and when it drops. This is the start of the optimization process. If, for example, the momentum of the call is repeatedly dropped when the price is brought up, that raises a very clear red flag. You can then begin to test new methods and approaches to bringing up and framing the price, until you find a route that actually encourages the buyer, instead of discourages. 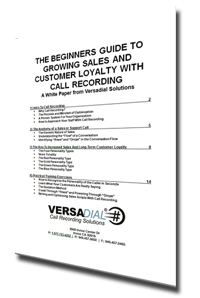 This excerpt is Part 2 of 4 from The Beginners Guide to Growing Sales and Customer Loyalty with Call Recording (White Paper). Please stay tuned next week for part 3. If you wish to download the entire white paper please go here.